When I learned that several of my mommies had never tried Indian dishes, I thought it would be good to do another Indian dish here. 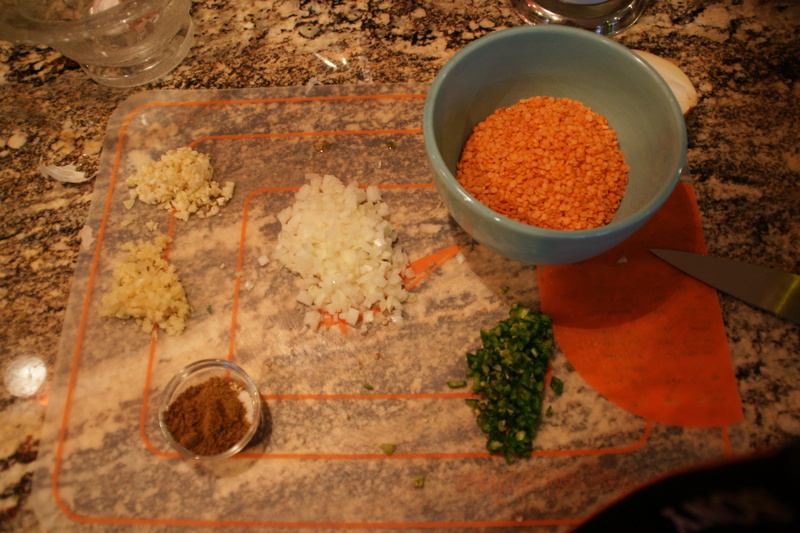 Tonight, I’m making another batch of garlic naan– Ken LOVES it– and a pot of Jacki’s red lentil dal (or dahl, or daal– I’ve been using two out of the three spellings and need to pick one and stick to it). The recipe comes from Cooking Light and the original contains instructions to make a carrot salad and garlic naan from pizza dough. If you like soups made from dried beans such as navy, split pea, or lentils, then you will really enjoy this dish. 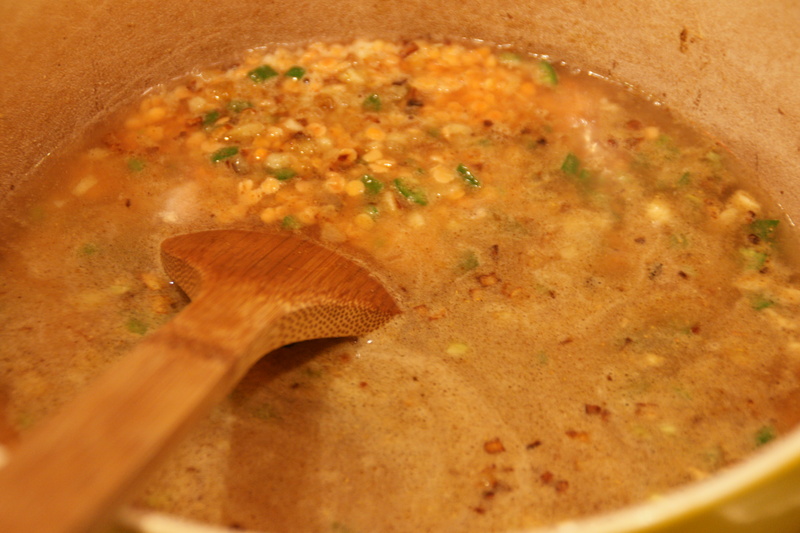 Although there is no meat, the dal is hearty enough to stand on its own., The primary difference between say, ham and lentil soup, and dal is that the lentils in dal have been split and the outer coating removed. I like them better that way since the hull can become tough if you don’t cook the lentils properly. This dal is seasoned with traditional Indian spices (think fresh ginger and cumin) and finished with several handfuls of spinach. Its heat comes primarily from serrano chiles. I had both basmati rice and naan on the table when I served it for the moms, but tonight we’re just doing naan. If you wanted to be even healthier, you could bake up a dish of brown rice– Alton Brown’s method, here, is foolproof. 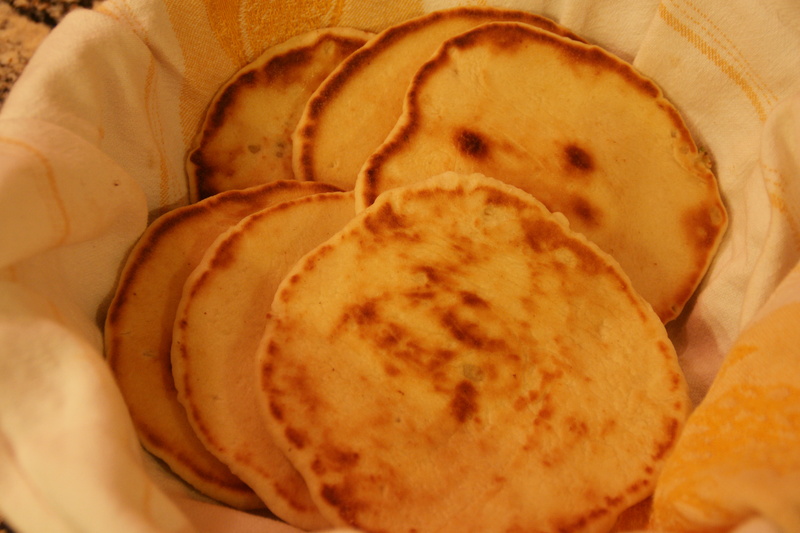 I’m focusing on the dal; the naan dough is prepared just like the other breads I bake, but the second rise is shorter and you roll out the dough and fry them on a non-stick griddle instead of baking in a loaf pan. The naan recipe is here. The dal cooks in less than 30 minutes, but you have to pre-soak the lentils first for 20 minutes. Prep the onion, peppers, garlic and ginger. 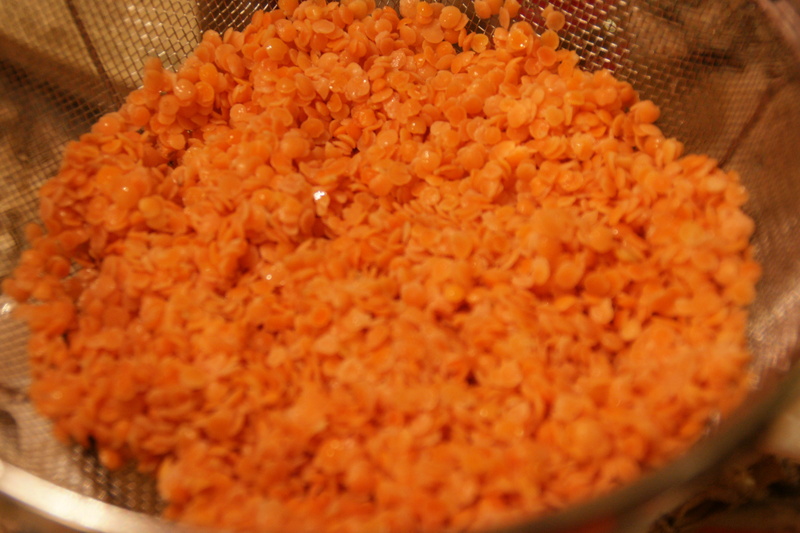 Soak the lentils in 3 cups of water for 2o minutes. Drain and set aside. In a medium pot, heat the oil over medium high heat. Add the onion and saute until browned. 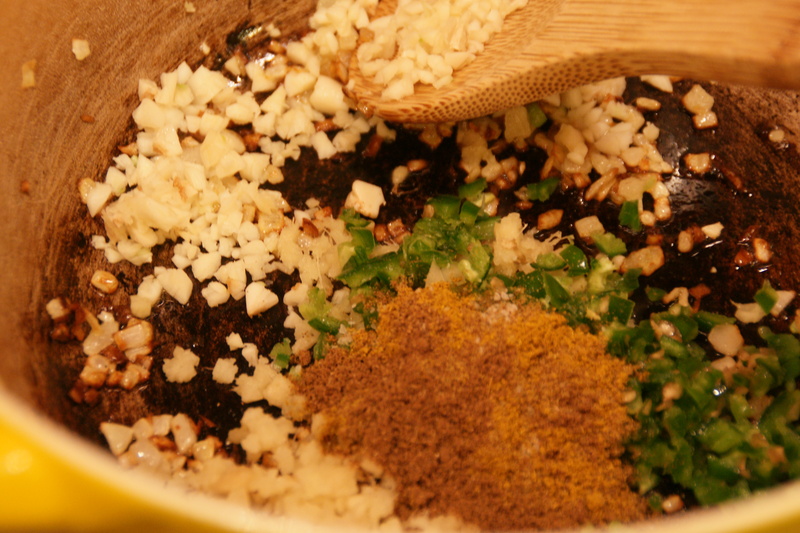 Add the ginger, garlic, salt, cumin, garam masala, curry powder and minced serranos to the pot and heat them until aromatic about 30 seconds. Add the lentils and remaining 2 cups of water. Stir to combine and simmer uncovered for 25 minutes, stirring occasionally. 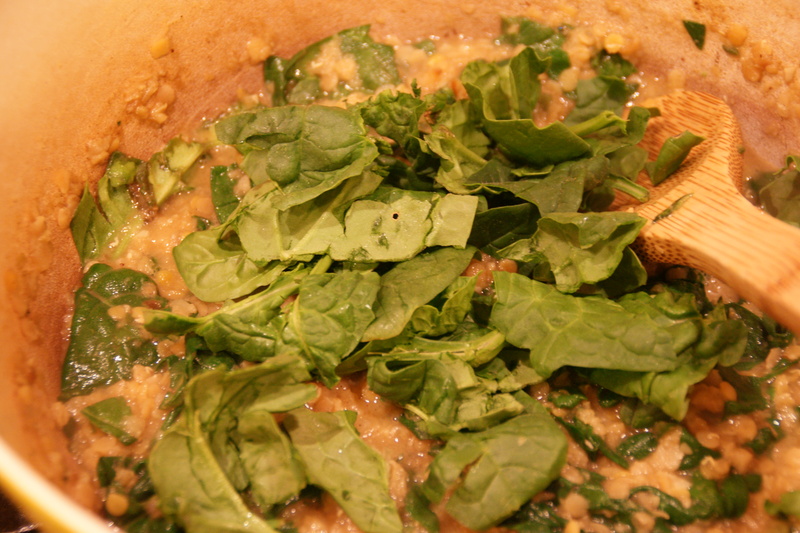 Towards the end of the 25 minutes, add the spinach leaves and stir until wilted. Serve with naan or rice or both. Scoop up the dal with torn bits of homemade garlic naan!